Skin Care with Ross: Product Pick of the Week! Straightforward and honest advice to help you look your best! Skin care and grooming tutorials, product reviews, and tips, all for YOU! Here you will find hand-picked product recommendations, interesting articles, and helpful hints to improve your skin and skin care routine....and whatever else floats my boat! Product Pick of the Week! My product pick this week happens to be among the first recommendations I ever made on MensSkinCareWithRoss! 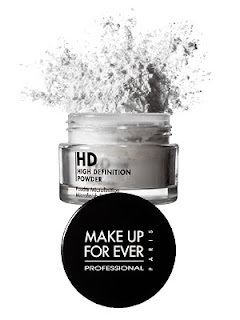 Make Up For Ever's HD Microfinish Powder is an ultra-fine, translucent, finishing powder that will give your skin a shine-free, smooth, even appearance. The powder is talc-free and contains light-reflecting particles that will soften the look of imperfections and even out your complexion. Just dust a little on your T-Zone and you'll be looking great! Just remember to use it sparingly. There isn't any other powder like this on the market, however other brands have attempted to imitate it without success. Be warned: To the naked eye this powder is invisible, however, with flash photography, the particles can reflect the camera's flash giving your face a white glow. Use the smallest amount possible with each use and you'll be fine! The HD Microfinish Powder is available in 2 sizes (0.17 oz & 0.35 oz), and I HIGHLY recommend their HD Kabuki Brush (VERY high quality and designed specifically for this powder)! Hey Ross, I actually bought translucide medium (really like it) and the stippling brush (also really like it) and found that the powder works really good but over time a little oil from secretion seems to seep through. Have you ever tried mixing the two and seeing the results?